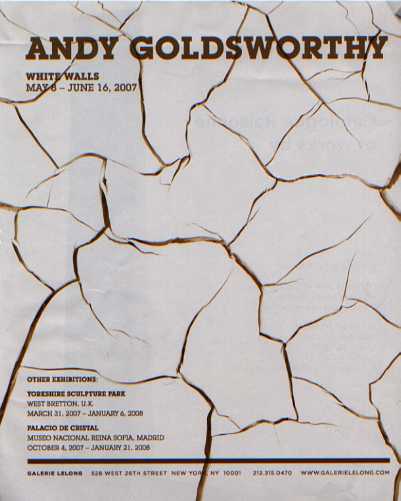 I wasn’t planning to write about Andy Goldsworthy today; but when I happened to page through Art in America a few days ago and saw this advertisement (a rather mediocre scan of it below) I changed my mind. The lines really caught my eye, even before I noticed the text and the name at the top. Such elegant curves and angles, variety of negative space, calligraphic lines, so simple — but made me stop and wonder. What was this – cracked mud, metal, ink, paint? 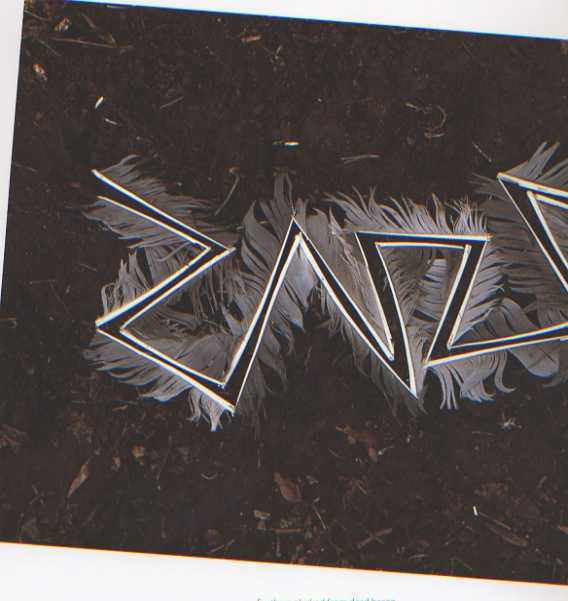 Ah — Goldsworthy, so of course it is some natural material, probably grass stalks. The exhibit is entitled “White Walls” so I suppose Galerie Lelong must have interior installation work by him. Ever since I read a Smithsonian Magazine article about Goldsworthy many years ago, I have been fascinated and inspired by his ephemeral art made completely with natural materials. 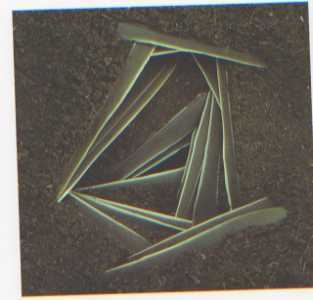 After seeing the ad, I paged through one of my coffee-table books, “Andy Goldsworthy: A Collaboration with Nature” (Harry N. Abrams, Inc., Pub., 1990) and wondered how I could possibly pick just a few favorite images for this blog entry. Mostly I am attracted to how he uses the color of his materials to form contrasts or progressions. However, I decided to follow the theme of the gallery ad and chose some examples that seemed to be more about linear composition. Below are some photos I’ve scanned from the book (click on the thumbnail for a larger view). Titles are almost like little poems, purely descriptive, and often include the weather conditions. There are many things that fascinate me about Goldsworthy and his work (though sometimes he seems to make things just to see if he can — sometimes perhaps it is more about the process than the result). He uses mundane materials and simple compositions to make uncommon art. He has a vision, perhaps a compulsion, and sticks with it (ouch, no pun intended!). He is true to his medium — skillfully using thorns to join grasses or leaves, for example, or slicing feathers with a sharp stone instead of a knife; nothing “unnatural”, though that makes it so much more difficult; it looks easy but of course it isn’t. (If you saw the documentary movie Rivers and Tides you’d have a good feel for his process.) 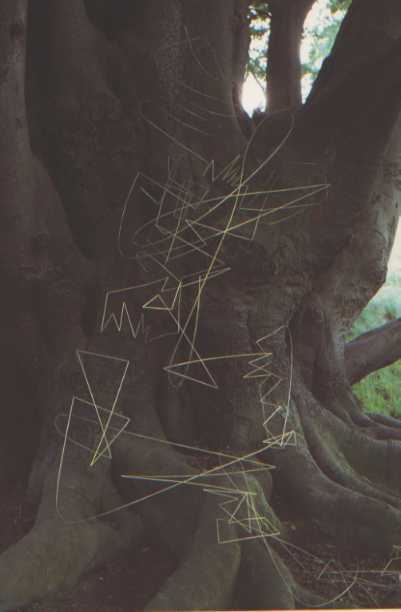 The basis of his compositions would work in any medium — for example, if the grass stalks pegged to the tree were inked lines on paper or neon tube lights in an empty room, it would still be an interesting composition. How does knowing this art is ephemeral, and made of natural materials, affect your opinion of it? I have a copy of “Passage: that belongs to a friend and what an experience to go through this book. The way Andy works – his material for commissioned structures is beyond my imagination. He has work in the US that I can see but to see the nature that he creates would be special – I love his fresh young green leaves dipped in water and wrapped around a branch – done in Birch Hill Farm, MA 2001. His stone houses are remarkable. Thank you for the heads up. Isn’t it possible or even likely that without the laying on of stringent conditions (the heron feathers must be used even if they smell), Goldsworthy wouldn’t have gotten as far as he does. It’s as if he _must_ try what he sees might work; only that way can he push himself close to the mysteries of the materials and his mind. I’m attempting to recreate the process of doing Cubist paintings with only the Cubists’ work in front of me. I have seen Photoshop programs which make the process simple, and I have a DVD of another artist’s relatively mechanical process which gets you a kind of Cubist work. But I have insisted to myself that I work only through what I can see and imagine; harder, foolish perhaps, but far more likely to result in an interesting time in front of the canvas. Maybe G. is simply into finding interesting challenges???? 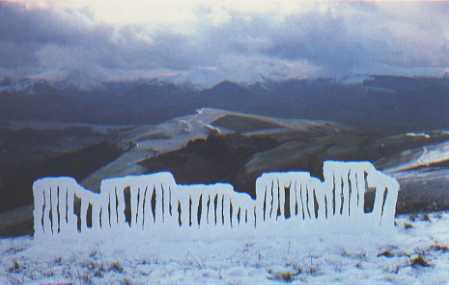 That said, Goldsworthy’s pieces have been a big inspiration – I love how he gets such mystery out of simplicity. I think Goldsworthy’s ephemerality logs in as almost as important as his images themselves — and you have to add in the further ingredient of the photography. Without the photography, no one but Goldsworthy and an onlooker or two would be able to see his vision, but with the photography, we are all allowed in. Goldsworthy works with an extraordinary collation of materials – the kinds of things Terry talks about — memory, play, childhood — and then the natural materials, carefully manipulated, which he is very faithful and attentive to. And then, the photography (and to a lesser extent his notes/titles), which must sometimes fail to capture what he wants captured, but when it does, it erases the ephemerality and turns the art into something more permanent, albeit lesser. 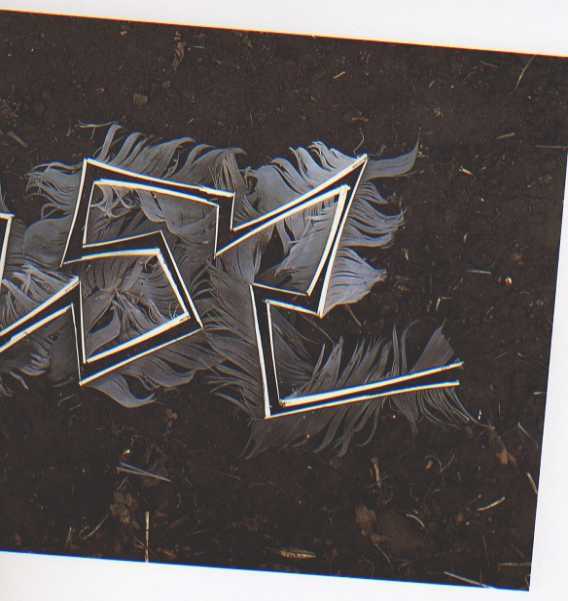 For Goldsworthy, the actual thing is the art as well as the photograph that remains. For the rest of us, all we have is the photograph. So it’s an almost perfect collaboration between art as self-indulgence and art is permanent vision. As well as a perfect collaboration between a beautiful abstract art that is thoroughly accessible because of the elements of memory, play, etc. 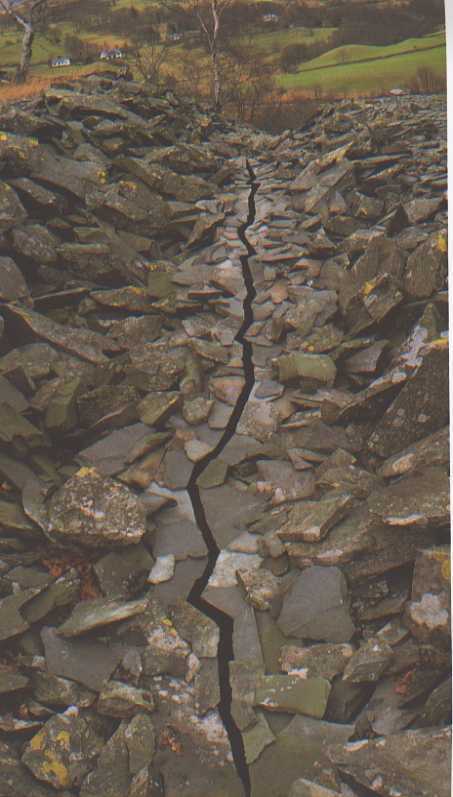 As you may have noticed I’m a great fan of Goldsworthy. I think he couldn’t have done this kind of thing without most of the 20th century behind him. Abstraction (recognizable and accepted by most people, even if they don’t like it), installation art (newer but still some years old by the time G. would have started with it), photography (150 years old, brought into serious art discourse early in the century), art as process (late 20th century conception). So he has picked up bits and pieces from the art of the 20th century, and turned them into his ineffable work. Thank you for this post. I am always astounded by his work. Early Morning Calm is just wonderful. I love the Rivers and Tides DVD. I will check out what is available at our library on my next visit. We live in the Sierra Nevada Mountains and the beauty of the rock formation with cracks, trees growing out of them, rivers cut through would invite Andy to be inspired. I will look at these formation and the building of our mountains in a different way as we hike. The work shows a wonderful mind that sees things in a special way. I’m going to check out the library for his work. 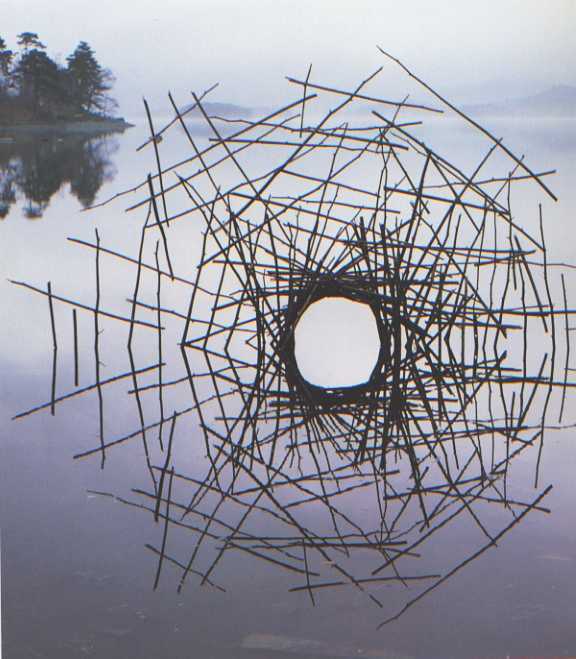 Andy Goldsworthy’s art is so luscious and so accessible I think partly because we have all done something like this on a small scale, even if it is just stacking stones just because they look beautiful or arranging kelp on a beach just to have it swept away with the tide. His art seems to me to touch something very intuitive in humans. As to how its being ephemeral affects my opinion. It puts into the realm of art of experience and art of memory, rather than something you can go back to again and again. Much of art is actually like this–music, theater for example. One approaches it differently, I believe, having the knowledge that the next time you see it it will have changed or disappeared altogether. I tend to want to imprint this kind of art on my memory in a way that I don’t necessarily do with all art. By the way, I was quite startled to see the image of the cracked earth or ice or whatever. It bears such a striking resemblance to one of the Journal quilts I made in 2003. You can see it here: http://www.geocities.com/terrygrant2/journal1.html Look at the second one–February.